Howdy folks! It's that time of year again, where we livestream some games and raise some funds for some kids in need. This year our donations will be sent to the Flint, Michigan Children's Hospital. Starting at 9am this Friday we'll be live at twitch.tv/warpportal with some of us (like CM Dragonlark) staying up to play games the whole night and through Saturday 9am. To say "thank you" for donations we have various prize tier packages available. You can donate at any time, it doesn't have to be donated during our stream. Edit: You can donate now and still receive thank you gifts, the donation drive will go until January 2017. Note that the thank you gifts will cease after December 31st 2016, so if you would like to get them please make your donations before the first of January 2017. 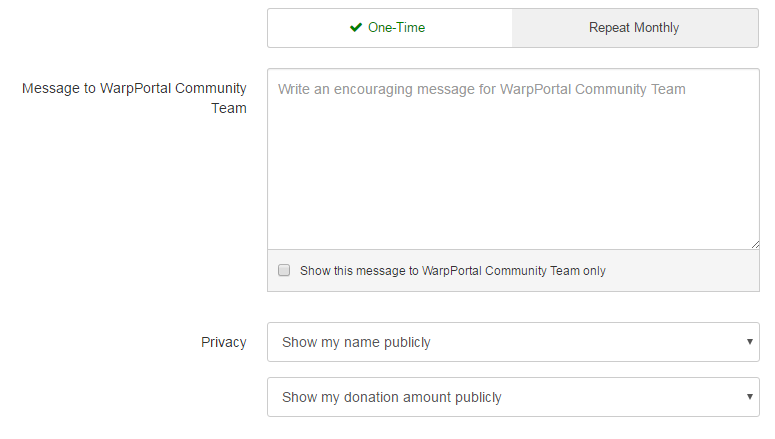 You can set your info to only show to the WP Community team, but we need to have this information in order to provide your "thank you!" rewards. Donations without this information. We will not be able to give rewards if your information is not included. -Donations are tracked based on the first donation made! If you make a 15 dollar donation on tuesday and a 100 dollar donation on Wednesday we count the first one! -Donations are done one reward pack per game account. If you want to donate multiple times on the same tier separately you can do that (it is for charity after all) -but the destination accounts must be different. Important notice: In the donation form users are encouraged to put names that contain no unusual symbols, ex: , ' " + ~ .. This is to avoid inconvenience and delays with gifts distribution. Edited by VModCinnamon, 19 December 2016 - 09:36 AM. Oda, are those the same headgear rewards for Classic? just doing this to make sure everyone sees this before people complain how they donated a total amount of 100 bucks and didn't get their stuff. Game account means if I have 3 ro accounts on same warp portal then I can do 3x donations on it and claim 3x prizes? Working on figuring out alternatives for classic donators. Can we have a gif image of the items so we know what we will be "donating for". Sure, I have added them to the OP. What happens if i donated sum of $100 in 4~5 donation? They stated before that it has to be all at once and that your initial donation is the one that counts. Hi Oda, I donated yesterday. How can I claim/when can I get the VIP package & rewards in game? Do we have to include our account name or just character name is enough? When will rewards go out? Are the items ie leopard hat tradable? I mean if the event is live until January, everyone can create more accounts just to donate $15 and get the leopard hat correct? I believe they can be traded. If the result is more donations then we would have if we were more restrictive with rewardsits not the worst thing in the world . I did not see this thread before donating I hope you guys had put the instructions in the FB page. Same Here, I donated and didn't put any of my game informations. Are the rewards all going to be named like the Leopard Ear Hat last year?